Weekend is the story of four guys and five girls who spend a weekend together at a luxury Oceanside mansion in Mexico. There is white sand and rolling surf, so it should be very pleasant, but what with the explosion and the dead phone lines it is hard for the gang to keep up that holiday spirit. The main character in Weekend is a young girl called Shani. She has known Kerry, Angie, Robin and Lena for years. Park is like a brother to her and Sol is a guy who may have a dark past; he certainly gives the impression of being quite handy with his switchblade. Then there’s Bert; he may not be the sharpest knife in the drawer, but he is a big, lovable lug with a heart of gold. He is also quite amusing. Flynn is the new guy. He’s from England, so none of the others really know him that well. Given the chance, Shani would like to get to know him considerably better, but as the story progresses she has grounds to worry that he might not be what he seems. The Luxury mansion belongs to Robin and Lena’s wealthy parents. Their father works in the music industry. Neither he nor his wife are there for the weekend, so Robin and Lena have the run of the place. Money can buy a great many things, but it can’t buy good health, which is a pity because Robin is in urgent need of a kidney transplant, but is at the bottom of the waiting list. Until last November Robin was very healthy, very vibrant and very in love with Park. Then—overnight—her world was turned upside down and everything changed. Now her life depends on a dialysis machine and Park is with Angie. Park isn’t the only one who has changed partners. Until recently, Sol used to be Kerry’s boyfriend. Now Lena is his preferred smooching companion. All in all, it’s not surprising there is a little bad blood between some of the parties concerned. 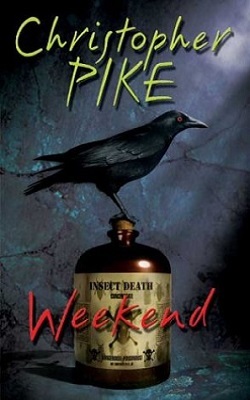 In a lot of ways, Weekend is more a mystery story than a work of horror and you end up wondering what happened to Robin, why did it happen, and who—if anyone—was responsible? If all that is a mystery though, so are some present events: why has the rest of the class not turned up, and why isn’t Robin’s dialysis working as well as it should be? Most of these things and more remain a mystery right until the end of the book, which is 190 pages long. To be honest none of these things would have been enough to keep me interested in the book, but a rather unusual Indian also features in the story. He appears to know a lot more about what is going on than anyone else, talks in parables, and has an uncanny ability with animals. His ability with animals seems to rub off on a couple of the other characters as well. Without the Indian, I might have got a little bored by Weekend. Mystery alone is seldom enough to keep my interest, but red-skinned guys, who have strange powers, and friends that wear feathers, can make all the difference.